How did cities emerge? Where were they located? How did they change over the course of human civilization? How did they change their surroundings? The answers to these questions are available, but hard to access. The United Nations World Urbanization Prospects, for example, only tracks urban populations and their locations from 1950 on, and so offers only a small, relatively recent snapshot of urbanization. The work of the historian Tertius Chandler and the political scientist George Modelski is much more extensive. The two painstakingly gathered population and archeological records from as far back as 2250 B.C. The problem, however, is that their data exist in the form of tables that are stuffed with hard-to-decipher numbers and notes. 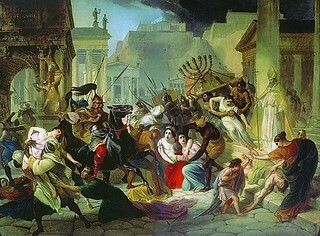 As we take it downtown, we might recall that it was on this date in 455 CE that the Vandals completed their sack of Rome. Three years earlier, the Vandal king Genseric and the Roman Emperor Valentinian III, had betrothed their children, Huneric and Eudocia, to strengthen their then-new peace treaty, but had delayed the wedding, as Eudocia was only 5 at the time. But on the 16th of March in 455, Valentinian was assassinated, and Petronius Maximus rose to the throne. Petronius, more concerned to consolidate power than to observe the decencies, married Valentinian’s widow, Licinia Eudoxia, and had his son Palladius marry Eudocia. Genseric was not amused; he sailed immediately with his army to Rome. The Vandals knocked down the city’s aqueducts on their way to the gates– which were opened to the invaders after Genseric agreed to Pope Leo I‘s request that he not raze the city nor murder it’s inhabits wholesale. The Vandals satisfied themselves with treasure and with a group of “hostages” including Eudocia and her mother. Petronius Maximus and Palladius had killed by an angry Roman mob before Genseric arrived.